Winco LDT-32 Stainless Steel 2-Piece Ladle 32 oz. TigerChef > Smallwares > Kitchen Utensils > Cooking and Serving Ladles >< Stainless Steel Ladles > Winco LDT-32 Stainless Steel 2-Piece Ladle 32 oz. 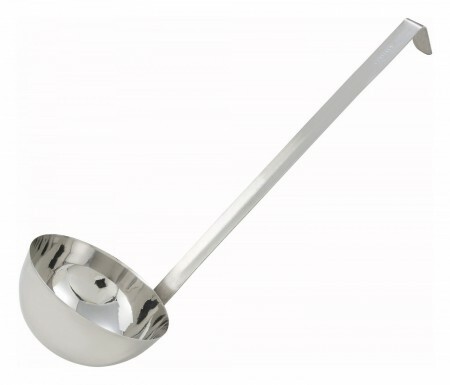 The generously-sized, rounded bowl of the Winco LDT-32 Stainless Steel 2-Piece Ladle 32 oz. delivers hearty portions of soup, broth and more. A great addition to any kitchen, this ladle has a long handle for reaching into deep stock pots and a hanging hook which allows it to be hung on a rack for storage. For outstanding durability, this two-piece ladle is made from rust-resistant stainless steel. 16 oz. - 32 oz.